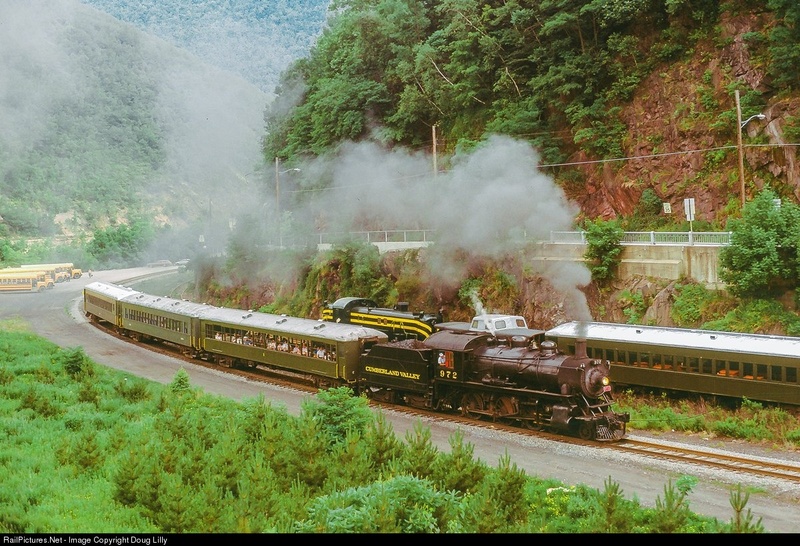 Railway Preservation News • View topic - Rail Tours /Jim Thorpe CP 4-6-0's and the other 7 survivors? Rail Tours /Jim Thorpe CP 4-6-0's and the other 7 survivors? Post subject: Rail Tours /Jim Thorpe CP 4-6-0's and the other 7 survivors? I was wondering if anyone could provide the dates that George Hart's CP 4-6-0's #972 and #1098 ran at Rail Tours, Inc at Jim Thorpe, PA, as well as any other off line special excursions. Does #1057 at the South Simcoe Railway still run - last operational photo I saw, as I recall, was in 2006. I assume the rest are display, other then George's #1098 and #972. CP #972 is on the deadline at Strasburg. The engine was brought to Strasburg several times though its last visit saw repairs too costly for George Hart to finance leading to Strasburg's outright purchase. A Partially-built Belpaire firebox was added by SRC in 1997-98 - an attempt, long before the arrival of LIRR #39, to roster a Pennsy style steam engine. The boiler and firebox are at Straburg - I assume the rest of the parts remain in Riverside, NY? CP #1098 was acquired by the Reading & Northern in Port Clinton, PA. Any status updates? Time line? Run dates? Rumor suggests it (was) is desired for use by R&N as power for the Lehigh Gorge Scenic trains. I rode a Philadelphia Chapter NRHS excursion in 1983 titled "Farewell to the GG1". It was a circle trip from Philadelphia to Perryville, up the Port Road to Harrisburg, then across to Reading, then back to Philadelphia. Somewhere south of Reading (I think it was near Birdsboro) we were told that we would be passing by a special excursion powered by Jim Hart's steam engine. I grabbed this shot through our Amcoach window of 972. Info I have on 1098 says it was test fired in the fall of 1998 - the last time it was under steam. I would consider it "stored" rather than "stored serviceable." I'd love to see 972 restored to her original configuration. I was wrong about the title of the trip where I photographed the 972. It was a NRHS sponsored circle trip, not a farewell to the GG1s trip. The GG1 trip was in 1981 and also went up the Port Road. Attached is a photo of our AMTRAK diesels on that 1983 trip in Harrisburg. Yup! That's the right date. The most recent pics of 1098 I can find are from 2010. Overall, she isn't bad looking and is stored at Port Clinton in one piece but a little rusty. 972 however, has not fared very well at Strasburg and is competing only with 1187 for being the most sorry looking of the lot. I was a volunteer with Rail Tours Inc. in York starting in June of 1965. I believe CP No. 972 came to York in early 1966. George Hart told me that it was the last steam locomotive sold by Canadian Pacific. I rode behind 972 down to Delta, Pa, on the Maryland & Pennsylvania a number of times, as well as on the Western Maryland on the epic trip from York to Cumberland, Md. and return doubleheaded with CP 4-6-2 No. 1286. I later made two or three trips behind No. 972 on the CNJ Nesquehoning Valley branch as well as on the Lehigh Valley main line from Jim Thorpe up to White Haven and return. 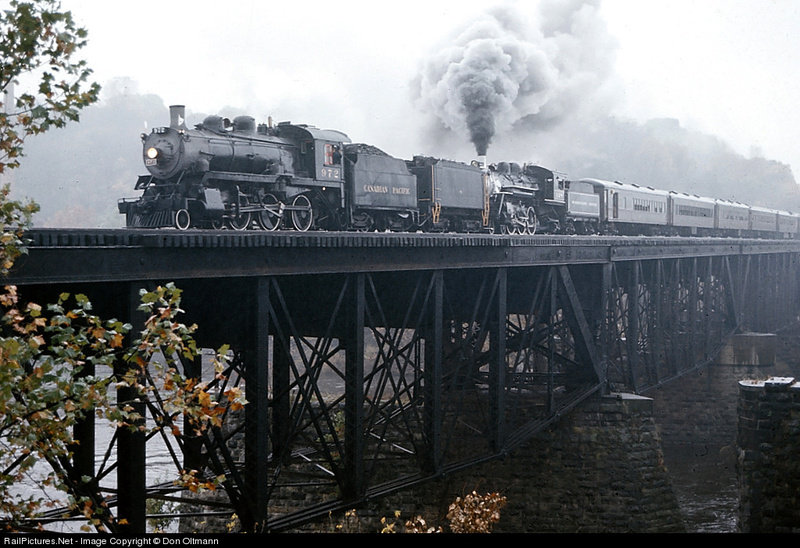 I also rode one of the trips out of Harrisburg to Carlisle and I rode on the trips to Hillside, NJ from Bethlehem when 972 led Florida East Coast 4-6-2 No. 148 (photo above). I never got a chance to ride behind No. 1098. My impression of 972 and the D-10 class in general was that they were pretty stout engines for ten-wheelers. I would love to see a doubleheader with 1098 and 425 on the R&N! I would love to see a doubleheader with 1098 and 425 on the R&N! Hmmmm. That would be interesting if 2100 and 2102 were back in steam at the same time. Reading Rambles anyone? Stumped the group at RYPN? was unable to answer with a "Let me Google that for you" link. Thanks for the bits and pieces - still looking for operation dates. CP #453 was one of the 9 noted sruvivors owned by O'Winston Link. Does anyone know its timeline. Apparently it was at Whippany, NJ at one point. Mitch, it was outside a hobby shop in Utica, New York for a long time, then was trucked to the O.W. Link Museum in Virginia. The locomotive itself looks very restorable, but sadly, some essential parts were removed by Mr. Link's heirs for reason known only to them. Bringing her back under steam will require machining of several rods. Did it ever make it to the O.W. Link Museum? "Thanks for sending Gary – this is not accurate. The Link Museum has not purchased this engine, perhaps there is some confusion with VMT? We do not have interest in acquiring engines or other rolling stock that requires expensive maintenance. Executive Director, Historical Society of Western Virginia "
Gary, thanks for following up my post and clarifying the official story. I couldn't imagine her being trucked to Virginia, and for what reason, but that's what I was told. Don't kill the messenger, guys! The Internet is missing pieces! In late 1990, Mr. Link hired Mr. Hayes, who owned Rome Locomotive Works in Rome, N.Y., to restore his engine. But he grew to suspect that his wife and Mr. Hayes had become lovers, a relationship they denied in court papers. Also see J. David's post in this RYPN thread from 2003: Link Photos Recovered in Pennsylvania! Next, K&K Hobby (a train and gun store) purchased it, cosmetically restored it and displayed in their parking lot. Here's a March 7, 2007 photo of it on display.